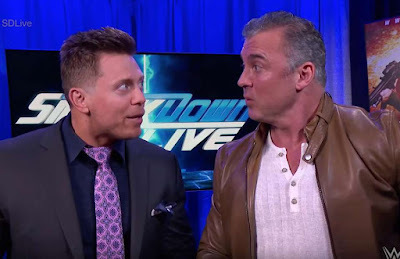 A couple of months ago, before they began to team, the rumours of a Miz and Shane WrestleMania match sounded like a strange choice. But now? Take my £9.99! This is going to be far better than it should have any right to be. What makes it so impressive is how they have actually strung out the story over a lengthy period and kept it interesting. By contrast, we have not even got a WrestleMania opponent for Asuka yet, let alone a story. But even if this did not have the benefit of a long build, I think that The Miz’s latest promo on SmackDown Live would have more than made up for any pitfalls. Now, every Miz promo is good, but this one was off the charts. It had extreme passion, references to his real life struggles, and just served as a reminder that he can make almost anything work. Shane McMahon and WrestleMania matches can be a hit and miss as far as having a logical story goes, but WWE should really be applauded for the stellar work on the slow burn build for this one. The news that Kurt Angle will face Baron Corbin for his last match was not exactly met with roaring fan approval this past week. In fact, it has been quite the opposite. While it does makes sense from a storyline perspective, for Corbin undermined and then replaced him as the General Manager, I am not sure that fans were all that bothered about this ever having any big redemption pay-off. I like Corbin, but there is no getting around the fact that his name was far down the list of those that fans wanted to see in this spot. After all, this had the potential to be the perfect match to pass the torch to someone of a similar caliber, such as Chad Gable, or to cap off an old rivalry with a legend such as John Cena or The Undertaker. However, there is speculation that this is a work, and his true opponent has yet to be revealed. Corbin playing up to the heat and Angle admitting that it was not a popular choice certainly feeds into this theory. Could WWE just be toying with us? It would hardly be the first time, and certainly not the last either.